I recently made a banana bundt cake but even after using 4 ripe bananas, I still had more to use up. It's been awhile since I made muffins so I decided to make banana coconut muffins using some sweetened coconut I had leftover too. The recipe I used is from Epicurious and had some great reviews... and these were fantastic! I thought these were even better the next day. Whisk together flour, baking powder, and salt in a bowl. Whisk together bananas, butter, sugar, egg, vanilla, and 1/2 cup coconut in a large bowl until combined well, then fold in flour mixture until flour is just moistened. 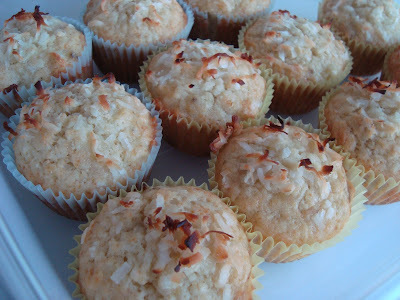 Divide batter among lined muffin cups and sprinkle with remaining 1/4 cup coconut. Bake until muffins are puffed and golden, about 25 minutes. Transfer muffins to a rack and cool slightly. Coconut and Banana that sounds like an excellent combo. I love the coconut topping. I have some bananas I need to use, so thanks for sharing! 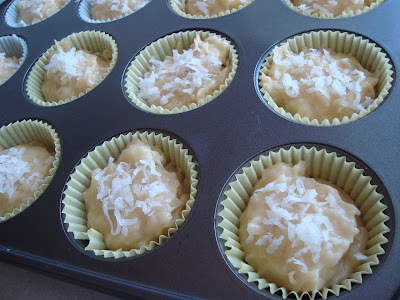 I'm going to make these tonight, I have extra coconut I need to use up! These sound delicious! I cannot wait to make them! Yum you did a wonderful job on these. I love the coconut topping! I thought this recipe was a keeper. My family loved it! I made banana loaf a couple weeks ago (forgot to take a photo to post it), and I was planning on making another variation this weekend for some friends. Thanks for the great idea! I made these last night and they are amazing. This is certainly a keeper! Was trying to figure out how to use up bananas, and happened upon your wonderful blog. These were adored by me, my 5 year old daughter, and even my husband who is not fond of sweet things. What a winner!